From Gymboree's Classroom Kitty line, pink dress with white beaded bow design and hidden pockets - size 7. Buy it Now includes ONE pair of brown cropped leggings from Limited Too, size 7. Very Cute! Perfect for a gift. Size 7 year. 6-9 mos 25-27 17-19 ½ 18 ⅛ 8 ⅝ 17 ¾. 3-6 mos 23-25 12-17 17 ¾ 8 17 ¼. 5-9lbs 17-20 5-9 16 5 ½ 15. Up to 5lbs up to 17 up to 5 14 4 ¼ 13 ½. WEIGHT (lbs). SOLDOUT AT GYMBOREE. Machine wash; Imported. 100% Cotton. I can't fix it if I am unaware of it. NEW Condition. SWEATER SIZE 5T NWT. 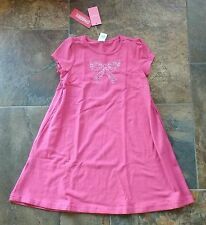 DRESS SIZE 5T NWT. SHIRT SIZE 5T NWT. BURST OF SPRING. 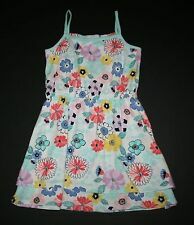 You are buying a gymboree island cruise dress size 5 nwt. So floaty and bright. Colorful watercolor floral print and a stylish bubble hem make our soft challis dress extra fashionable. Girls size 5. Features grosgrain bows, ruffle neck and bubble sleeve and hem. From Gymboree's Daisy Park line, large flower pattern dress in size 7 (RV $34.95), black cardigan sweater with floral pattern (RV $34.95) in size M (7-8) and matching soft headband (RV $9). New with tags, retail. 5% SPANDEX. 38% POLYESTER. 57% COTTON. Get Images that. Make Supersized Seem Small. Bottom part of dress is blush pink 😍. 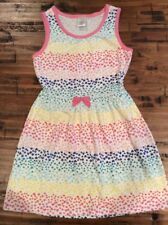 You are buying a gymboree everyday favorites dress size 5 nwt. Comes from smoke free home. Drop waist ; shirred skirt. Machine wash ; Imported. 60% cotton/40% acrylic knit. 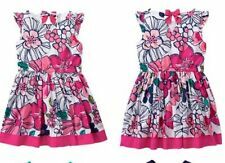 Adorable Gymboree girls lightweight dress. Knee length. Girls size 10. Top is a pinkish-red color. Bottom is a blue background with pink and white apples. 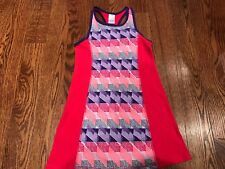 You are buying a gymboree holiday dressed up dress size 8 nwt. Comes from smoke free home. 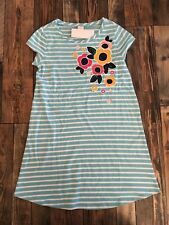 You are buying a gymboree blue safari dress size 8 nwt. GYMBOREE GIRLS Fancy BLACK GOLD STARS Nwt Dress Holiday Dressy Size 7 Condition is New with tags. Shipped with USPS First Class Package. NWT GIRLS GYMBOREE WHITE DRESS Red White Blue Stripe SIZE Xxs 3 Condition is New with tags. Shipped with USPS First Class Package. Flutter sleeves. Machine wash; imported. Drop waist. Allover print.